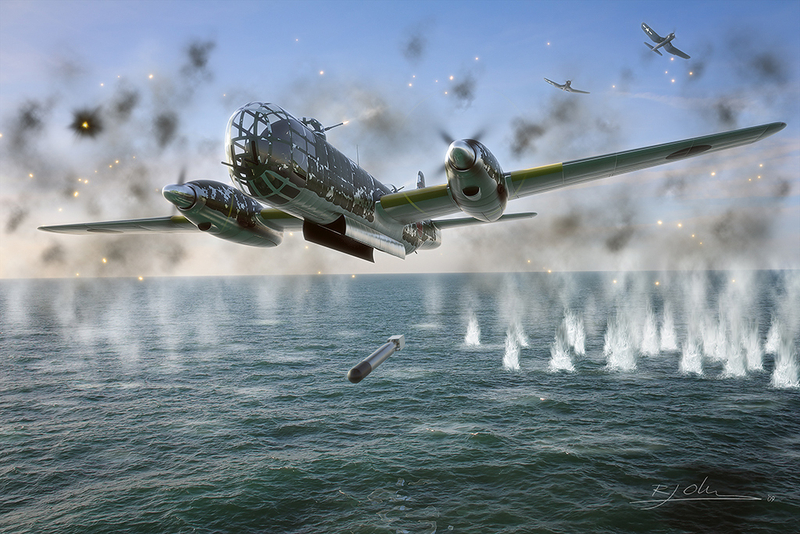 Another image made for [URL=http://www.digitalaviationart.com/forums/jsp_cover_smaller.jpg]Midland Publishing's Japanese Secret Projects[/URL]. The aircraft shown is a Mitsubishi G7M 'Taizan'. It was a mid-war naval bomber design, which was supposed to replace the G4M 'Betty' bomber. The Taizan failed to impress however and was never built. The image shows what it could have looked like in the final stages of a torpedo attack against a US Navy aircraft carrier. Heavy AAA fire is greatly reducing the bomber's chances of survival, to a point where even the defending F4U Corsair fighters break off to get out of harm's way.